New patio or city road/water/power line work endangering your lily garden in bloom? If you are very careful, by digging up the entire "clump" with a good root ball of soil, you should be able to move them without any damage. Dig a hole slightly bigger than what you need, fill with water and some loose soil to create "mud". Place the entire clump into the hole, filling in and gently tamping more loose soil down around the root ball. Use just enough water to firm the soil and withhold water until the soil has started to dry out, typically 7 to 10 days. Do not over water! This method should only be tried under emergency conditions, the best time to transplant in the fall after the foliage have matured, so don't try to save time and do any dividing right now. If you do not expose the bulb and roots to air, they will never know they are in another location. The biggest mistake is to give the bulbs extra water to cover "transplant shock"; if the lower leaves turn yellow and fall off, they received more moisture than they could handle, and you need to stop watering until the soil is dry at least two inches below the surface. In spring, if the bulbs are just beginning to break though the soil surface and need to be moved, dig them very carefully, so you do not accidentally break a sprout. If the sprout is broken, it will not grow another one the same season and you will have no bloom from that bulb. Dig the receiving hole or have a large sturdy bucket, pot, or cardboard box (lined with plastic) ready for the lily bulb or clump.� Water deeply the day before transplanting so the bulbs are well hydrated. Cut off any flowers or buds to enjoy indoors in vases, but keep as many leaves as possible on the remaining stem, attached to the bulb. Start digging about 5 or 6 inches from where the stem comes out of the soil, go down at least 12 inches, and then begin working your way near the bulb to determine its true location.� Sometimes lilies will send up a shoot around a rock, or the underground stem be lying on its side.�If you cut a bulb in half with a shovel it sounds similar to biting into a ripe apple, so be careful. After you know exactly where the bulb is located, carefully dig around the stem and avoid disturbing the stem roots. Next lift the bulb - with stem attached - out of the hole.� If you have accidentally cut off roots beneath the bulb, it is OK for now. Those bottom roots are there to anchor the bulb and are not as critical at this point in the lily's growth - but you will probably need to stake the plant for the remainder of this summer. Place the root ball into newly dug planting hole; one to two inches deeper than it was growing. Then, back fill the hole, press down soil, and water ONCE to settle the loose soil. Do not water again for at least a week. If you have to transport the lily for some distance in a bucket or some other container,�pack damp sawdust around the root ball but do NOT add water.� The damp sawdust (or pet bedding) will keep the root ball in good condition for about a week if you are moving from one house to another, but it is much better to plant the clump immediately.� Put resting lilies into shade - they need light but not hot or direct sun while they are in boxes or buckets.� Plant into your new garden as soon as possible and do not water replanted lilies again until soil is dry two inches below the surface. If moving to pots, back fill with good potting soil and water to settle soil as when replanting in the ground.� Also, do not water the lilies again for at least a week; remember that your bulbs were watered before being moved.� If they receive too much water, their lower leaves will turn yellow and fall off.� Keep freshly planted pots in light shade until you can move bulbs into the garden this fall - after the foliage has matured and the stems are brown. When potting lily bulbs, use one gallon of potting soil per mature bulb in a container with ample drainage holes which is at least 8 to 12 inches deep. 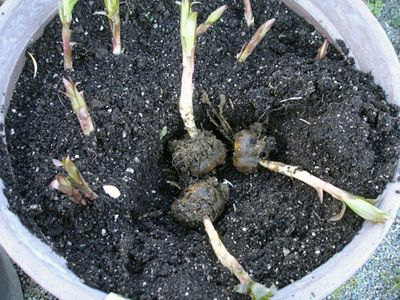 Lily bulbs make stem roots between the bulb and the surface of the soil; these are �feeder� roots which absorb nutrients for the bulb and are grown new each season. The basal plate roots on the bulb's bottom actprimarily as a counterweight to keep wind from toppling the stem, and are of less importance than the feeder roots. In containers that are only 8 inches deep, place bulbs almost on the bottom of the pot so there will be at least 6 inches of soil covering the lilies. Any less soil on top of the bulb will prevent stem roots from forming properly, which will severely limit the growth potential of your lily bulbs. Provide at least one gallon of potting soil per large bulb, to give lily roots enough room and to encourage bulblets to form on the underground stem. Pre-moisten potting soil before filling your container. Place bulbs - pointed side up, roots down - about 4 to 5 inches apart; any closer and you�ll need to divide the bulbs more frequently than every two to three years. Put a small plastic label underground next to the bulb for future reference, should the top label fade or be lost, and cover your bulbs completely. Lightly pat down the soil to firm it. Water the newly planted lilies, only until you see water streaming out of the drainage holes�and if needed�top off with more soil. Leave about two inches between soil and the top rim of the container. Add a marker label for easy reference and do not water lilies again until the potting soil is dry two inches below the surface. Lily bulbs are designed to store moisture in the fleshy scales that make up the bulb; they do not swim well, so if you allow their soil to stay constantly wet the bulbs will most likely rot. Lily bulbs grown in containers must be protected from excessive moisture and/or �freeze-thaw� cycles during winter, or bulbs will rot. Successful strategies for over-wintering lilies include moving containers under decking, beneath a roof overhang, into an unheated greenhouse, cold frame, or into a cool garage for winter. Keep in mind that soil in containers should stay slightly damp, but not be soggy. In spring, move lilies into a protected area outdoors when sprouts begin to emerge. In a home garden, do not dig out bare bulbs to store over winter. We use humidity controlled coolers and damp peat moss to store bulbs indoors; gradually dropping air temperature to mimic nature until the peat moss is frozen, thus keeping bulbs in hard dormancy. Lily bulbs are happiest when left in the garden over winter or stored undisturbed in pots to grow larger with more flowers next summer.